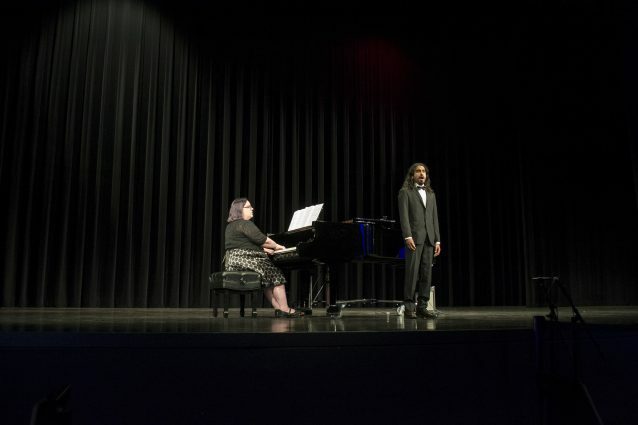 The East Los Angeles College Music Department presented a student recital on November 21 which included accompanist Melissa Sky-Eagle. Guitarist Eric Qing Xie rocked the electric guitar with beautiful strumming, elegant and sweet sound. It added a perfect dynamics to the song, “Days of Wine and Roses” by Henry Mancini. The second song, ”Etude, No.3 Op.60,” consists of string-picking -lullaby tone written by Matteo Carcassi, performed by Ruben Gomez Jr., who played with smooth transitions of his fingers on the guitar. The third act was soprano Alondra Ruiz, who sung with nice riffs and perfect jumps. She has a beautiful vibrato for “Pur dicesti o bocca ella,” written by Antonio Lotti. Violinist Daniela Herrera, strummed with nervousness but regained confidence ending with strong fingers and a good bow hand to the tune, “The Two Grenadiers,” written by Robert Schumann. Harry Faustino finger picked on the guitar with lightning fast fingers to the song, “Etude No.6” written by Leo Brouwer. “Sarabande Etude No.7,” written by Anonymous and Matteo Carcassi, was played on the guitar by Alexander Botello. He played with great feeling, smooth transitions and strong fingers. Marco Solis, a tenor with great breathing,and beautiful vibrato performed a challenging song, ”Danza, Danza, Fanciulla Gentile,” a piece from Francesco Durante. Pianist John Solano played with such enchantment capturing the mood in the room to “Capricci No.1 Op.76” by Johannes Brahms from Klavierstucke. Claire Dalia Marquez sung with character, dynamics, and great tone to, “Porgi Amor” by W.A Mozart from Le Nozze di Figaro, K.492. Zhaotong Tang hit the soprano notes perfectly while also lightly grasping the lower notes. She then finished the song with a dramatic belt from Semele, HWV 58, the song “Where’er You Walk” by G.F. Handel. The song, “Sento Nel Core” by Alessandro Scarlatti was performed by Rosamaria Garcia, the only mezzo-soprano. Garcia used her mixed voice with great resonance in her performance. He played with great build up to notes, his fingers were well relaxed and he had outstanding energy on the piano from “Well-tempered” Clavier by J.S. Bach. Baritone Eugene Lopez sang with great vowels, great energy, overall smooth transition to the song, “Avant de quitter ces lieux” from Faust, by Charles Gounod. 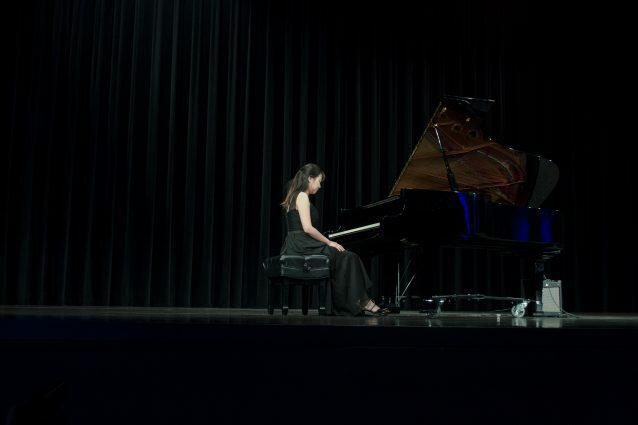 Pianist Shan Jiang dazzled the audience with her fast crossing hands and mood manipulating skills to, “Etudes-Tableaux, Op.33, No.6 in E flat Minor,” by Sergei Rachmaninoff. Ismael Mayoral kept the mood and character with outstanding breath support and dynamics to, “Sonata for Clarinet and Piano” by Francis Poulenc Romanza.